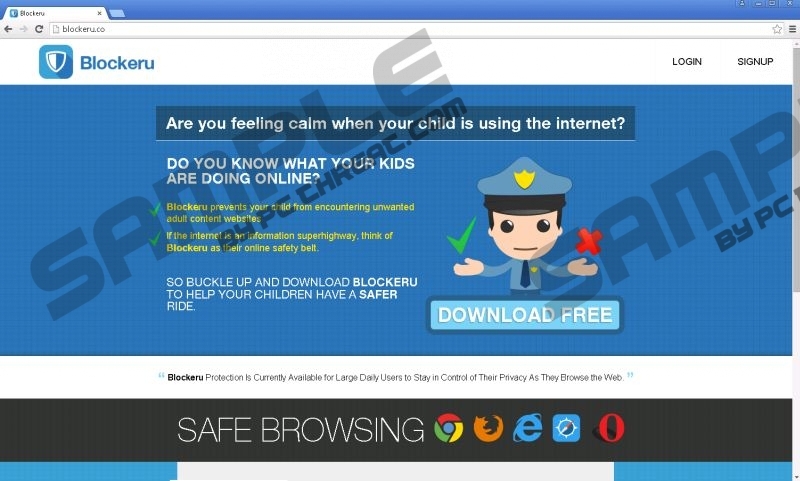 Blockeru pretends to be an application that “prevents your child from encountering unwanted adult content websites,” but we have found that it is nothing more than a useless piece of adware from the so-called Lyrics family. If you are annoyed by third-party ads, such as pop-up ads, it is possible that your computer has been infected with this adware program. If so, it is also likely that this infection is only one part of your problems; there can be other related malware programs as well. These applications along with Blockeru may expose you and your Windows operating system to unsafe third-party content and cyber criminals. In order to keep your computer healthy, you should remove Blockeru as soon as you can. Let us tell you more about this infection and what you can do to make it go away. Although this questionable application has an official website at blockeru.co, it is really a webpage. But it is rather a semi-functioning one since you cannot actually download Blockeru from there. No matter how many times you click on the download button, nothing happens at all. We think that it is quite suspicious behavior since it looks like the publishers of this program do not even want you to be able to download it from the website. But there has to be another way to spread this app so that it can generate quick and easy money for the publishers; and, of course, there is. It is called software bundling. So it is possible to find this adware in freeware bundles that may also contain additional malware infections. If you install such a bundle, you will get a whole “bouquet” of malware that will soon stink. Few users know that it is actually possible to opt out of the installation of unwanted applications and tools if you are attentive during all the steps of the installation wizard. It truly pays to be patient when it comes to freeware bundles. Deleting Blockeru cannot save you in this case, and you will have to tackle all of the other possible threats as well if you want to restore your system. Blockeru is very similar to View That Deal, which is another recent member of the same family. This adware can collect information about you and send targeted ads to your screen. However, we strongly advise you not to click on any third-party ads shown by this adware program. You can never know when you might be redirected to an unsafe website and what might happen there. Getting more infections onto your computer is the best case scenario, but it is also possible to get scammed other ways, which can result in losing money or being a victim of identity theft. You should delete Blockeru right now if you intend to avoid these scenarios. Fortunately, you can easily uninstall this useless program from your computer via Control Panel. We have included step-by-step instructions for you in case you are not familiar with the necessary steps. Keep in mind that you can actually prevent a lot of malware infections from infiltrating your operating system if you set up some rules of web surfing for yourself. Keeping away from suspicious websites and downloading software only from reputable sources are definitely useful ones to stick to. Open the Start menu and choose Control Panel. Select the undesirable application and click Remove. Press the Windows button in the bottom-left corner. Select the undesirable application and click Uninstall. Tap Win+W and type in Control Panel. Press Enter. Click on the undesirable application and click Uninstall. Press Win+X and open Programs and Features. Select the unwanted application and click Uninstall. Quick & tested solution for Blockeru removal.